Click on the album title above to head directly to the appropriate review. From An Luinneach in the Donegal gaeltacht of Gweedore, singer Aoife Ní Fhearraigh is probably most widely known for her 1996 Gael Linn album Aoife, though she has subsequently recorded The Turning of the Tide for the Celtic Collections label (a selection of very middle-of-the-road ballads and contemporary material, sung mostly in English). 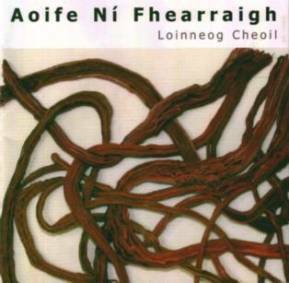 However, back in 1991 Aoife released her debut Loinneog Cheoil on cassette, the fact that the accompaniment was provided by the nascent Dervish making the album a collector’s item. Anyone searching for such, however, should continue their quest since this new release is a somewhat different affair despite the tray-liner notes suggesting that the CD is a straightforward reissue of the original. “Loinneog Cheoil – Aoife’s new album or old album? Well, a bit of both; this is a new album which includes all the recordings on my debut album given a new treatment by another Donegal resident Manus Lunny. Those two bonus tracks are An Mhaighdean Mhara and Cad é Sin Don té sin (a version of the latter also appears on the Tráthnóna Eile compilation. Anyone expecting a similar sound to the album Aoife, which was very much a multi-textured Clannad-style affair, will be surprised and refreshed by the relative simplicity of many of the arrangements displayed here. For instance, a song such as Neansaí Mhile Grá is served as a straightforward ballad with Aoife’s undeniably enchanting voice allowed to weave its spell to a backing of largely finger-style guitar and very understated keyboards. In contrast, the arrangement for the succeeding song, Fuígidh Mise an Baile Seo, employs the same instruments (plus fiddle) but captures all the inherent cheekiness of the lyrics. The musicians featured on the album, by the way, are Paul Gardiner (keyboards), Brendan Monaghan (please don’t remind him of his days in Shebeen – flute, bodhrán and whistle), David Muldrew (guitar), Stephen Campbell (fiddle and viola) and Manus himself (bouzouki, guitar and keyboard). At times Aoife’s church choir grounding comes to the fore. Fill, Fill a Rún ó, for instance, is positively elegaic in its intensity (thanks in part to some splendidly atmospheric viola-work from Stephen), though this is a more than appropriate approach since the song’s subject is a Catholic priest who has switched to a Protestant denomination (the translated lyrics include the wonderful lines ‘And I have yet to see anything more bizarre than the Reverend O’Donnell as a minister). Dónal Óg is perhaps the album’s zenith and allows Aoife full scope to express the song’s passion unaccompanied, though An Mhaighdean Mara pushes it very close indeed and its accompaniment, as on the entire album, is both considered and full of grace (Brendan Monaghan’s contributions are often sublime – particularly the simple piping motif on Cuaichín Ghleann Neifin). 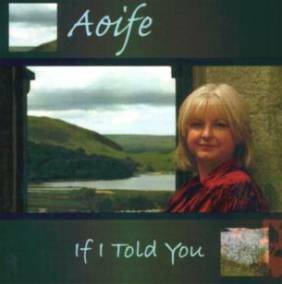 All told, Aoife will appeal to everyone who enjoys a singer who can capture the essence and express the emotions of a song without ever becoming cloying or over-expressive. It should also entice anyone who loves the sound of County Donegal for, in truth, this recording really could not have emerged from anywhere else in Ireland. So, congratulations must go to the Dutch label, New Samarkand Records, for making Loinneog Cheoil available and for the inclusion of all the songs’ lyrics coupled with superb translations by Anna Bn. Mhic Laifeartaigh. One slight quibble is that details of the songs’ sources have not been included, especially since some songs, such as Úrchnoc Chéin Mhic Cáinte, are not widely known. Aoife Ní Fhearraigh’s new album If I Told You demonstrates that she has woven a rich variety of vocal sources echoing influences from her own Gaeltacht locality Gweedore – Eithne Ní Bhraonáin (a.k.a. Enya), Maighread and Tríona Ní Dhomhnaill – along with influences from further afield into a musical tapestry which is her own personal style. While she remains faithful to the great tradition of Gaelic folksong from whence she comes, she explores other musical directions which add to the breadth and depth of her repertoire providing an appropriate showcase for her excellent voice. The opening track, the traditional folksong Love and Freedom gets the album off to a lively start and gives everyone on the album, Aoife and backing group, the chance to display their talent. One of the most striking tracks on this album is the Gaelic anthem in praise of the Irish Saint Brigid, Gabhaim Molta Bríde on which the atmosphere is enhanced by the arrangement, especially the haunting low whistle played by co-producer Brendan Monaghan. The masterful backing group Aoife has assembled to accompany her on this album certain augments and supports her singing giving sympathetic support to the voice while never being intrusive at any time. I think this track owes a track owes a debt to the singing of the late Eithne Ní hUallacháin and her sister Pádraigín. The version of the much recorded bilingual love song Siúil, a Rúin is taken at a lively upbeat pace although it is in essence a sad song and I am not sure that that pace suits its spirit and sentiment, but, that said, it is a very tight arrangement with first class backing. By contrast the song An Seanduine Dóite is treated quite tamely and a little straightjacketed in strict tempo whereas I would have thought that the jocular nature of this song would have lent itself to a little more abandon. If this be love is a Mick Hanly song set to the air Coinnleach Glas an Fhómhair (‘The Green Stubble of Autumn’) made famous by Aoife’s neighbour Máire Ní Bhraonáin and Clannad and even though this is a relatively new song in English I cannot help but notice Máire’s presence hovering in the background but maybe that’s just my Clannad conditioning. I must say I liked Aoife’s version of Davy Mulgrew’s song Long Hard Night and once again the backing vocals in the refrain add greatly to the rendition. One of the main tracks on this recording is Táimse im’ Chodhladh, a Munster song in the aisling (vision) form which Aoife sings beautifully and it’s good to have an English translation of the Irish words in the liner booklet. I don’t believe the song is one of the big Munster aislingí but it may perhaps be a lesser poet’s attempt at the form. It would have been helpful to have had notes on every song songs; a little background to each is always of added interest to readers. If I Told You is a fine album from an excellent singer. It has a good range of material which secures Aoife Ní Fhearraigh’s place as one of the most accomplished folksingers in Ireland. She is ably supported by two very fine producers in Brendan Monaghan and Paul Gardiner who also contribute to the excellent backing group. I await more from Aoife. This is an original review for TIMR, printed here with the kind permission of its author. Aoife Ní Fhearraigh’s website is www.aoife.ie and more information about the two labels can be found at www.newsamarkand.com and www.claddaghrecords.com.